It’s not a scientific secret that balanced nutrition in the body is important for maintaining healthy skin. Nutrition may not produce striking rejuvenation, but neglecting the proper sustenance for skin will make it age considerably faster. 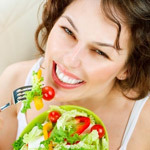 Here are nutritional guidelines to keep your skin looking younger than you are. It’s naive to believe that changing your nutrition is going to wipe out all your wrinkles or completely stop skin aging. But it is just as naive to think that you can eat (or neglect to eat) whatever you want without any effect on your skin. What you eat affects every organ in your body, and skin - the largest organ - is no exception. Food intake, particularly the consumption of fat and sweet and spicy food, is known to influence skin conditions. But when the nutrients are ingested and absorbed into your bloodstream, they are sure to be delivered to your skin cells. Nutrients and foods that benefit your skin also tend to benefit other body systems and overall health. Of all the news coming from the beauty community about skin, the biggest buzz is about the power of vitamins, minerals, and other nutrients to give skin a more radiant, healthy, and youthful glow. Nutrition has some effect on the mechanisms of aging of the body as a whole. Inhibiting these mechanisms slows down the overall aging process, including the aging of the skin. Deficiencies of certain nutrients, such as vitamin A, B-complex, and essential fatty acids are known to cause various forms of dermatitis and other skin conditions. Proper nutrition may help partly inhibit physiological aging but does little to protect the skin from the outside world. The latter must be achieved by limiting sun exposure and the use of proper (UVA+UVB) sunblocks. • Drink 6-8 glasses of water a day. A well-moisturized skin is somewhat less prone to developing of wrinkles. Drinking plenty of fluids throughout the day ensures proper hydration of the body and helps reduce skin dryness. Coffee and sodas are not a good substitute for water because they contain caffeine, which is a diuretic, i. e., a substance promoting the excretion of water via urine. Don’t drink too much fluid 2-3 hours before going to bed. This may cause morning puffiness and excessively stretch your skin. Don’t forget that the journey towards healthy skin begins with good nutrition; a well-balanced diet is essential for healthy skin. It won't necessarily reverse damage that is already done, but it will prevent more damage and nourish your skin by supplying the essential vitamins and minerals that your skin needs to keep it looking healthy.